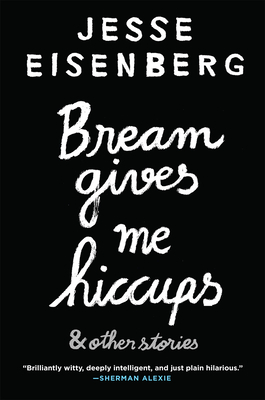 Bream Gives Me Hiccups: And Other Stories is the whip-smart fiction debut of Academy Award-nominated actor Jesse Eisenberg. Known for his iconic film roles but also for his regular pieces in the New Yorker and his two critically acclaimed plays, Eisenberg is an emerging literary voice. Taking its title from a group of stories that begin the book, Bream Gives Me Hiccups moves from contemporary L.A. to the dorm rooms of an American college to ancient Pompeii, throwing the reader into a universe of social misfits, reimagined scenes from history, and ridiculous overreactions. In one piece, a tense email exchange between a young man and his girlfriend is taken over by his sister, who is obsessed with the Bosnian genocide (The situation reminds me of a little historical blip called the Karadordevo agreement); in another, a college freshman forced to live with a roommate is stunned when one of her ramen packets goes missing (she didn't have "one" of my ramens. She had a chicken ramen); in another piece, Alexander Graham Bell has teething problems with his invention (I've been calling Mabel all day, she doesn't pick up Yes, of course I dialed the right number - 2 ). United by Eisenberg's gift for humor and character, and grouped into chapters that open with illustrations by award-winning cartoonist Jean Jullien, the witty pieces collected in Bream Gives Me Hiccups explore the various insanities of the modern world, and mark the arrival of a fantastically funny, self-ironic, and original voice. Jesse Eisenberg is an Academy Award-nominated actor, playwright, and contributor for the New Yorker and McSweeney's. He is the author of three plays, Asuncion, The Revisionist, and The Spoils, which won the Theater Visions Fund Award. Eisenberg's acting credits include The Social Network, Now You See Me, Adventureland, The Squid and the Whale, The Double, and The End of the Tour. Forthcoming acting credits include Batman v. Superman.